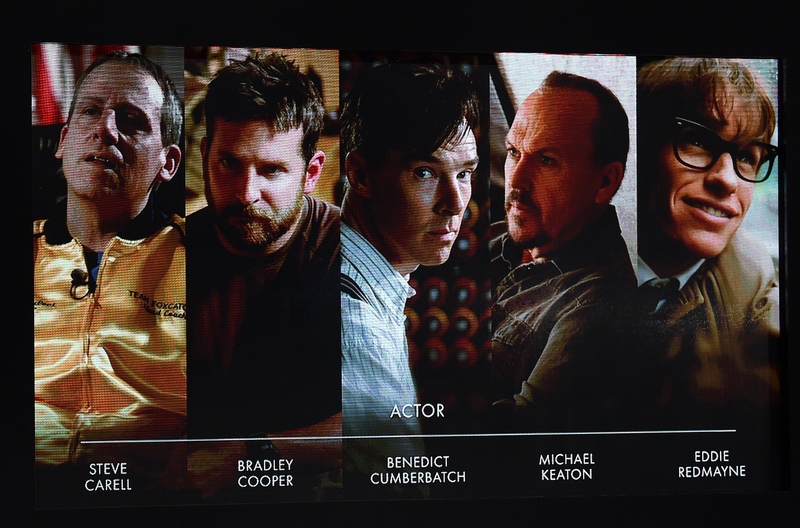 When the nominations have a harsh lack of diversity, it's hard for the Oscars' telecast to really award it. That was the biggest problem with the 87th Academy Awards ceremony. Despite success with great moments of humor thanks to host Neil Patrick Harris and a rousing call to action for women's equality from Patricia Arquette, the moments that honored diverse actors, actresses, filmmakers, and projects were few and far between. Sure, there were self-aware diversity jokes — NPH's opening line spoke to the "best and whitest, er, brightest" in Hollywood — but overall, the 2015 Oscars ceremony didn't do much to improve upon the 2015 Oscar nominees. However, the moments may have been few and far between, but there were some powerful and emotional ones in favor of diversity. Of course, the telecast was never going to fully succeed in fixing its nomination debacle just by providing a stage for commentary, but then again, the Academy should have used their platform to reward the films and people that deserved the recognition in the first place. But let's see how the ceremony did, shall we? Here are the most important diversity-related moments of the telecast, whether good or bad. The musicians' performance of the Oscar-nominated song "Glory" from Selma was a gorgeous and extraordinary moment for the importance of diversity, race relations, and race equality in America. You could hear every single moment of pain and pride and heart in every lyric of the song from both Legend and Common, especially in the words relating the Civil Rights Movement to modern-day racial tension in places like Ferguson and beyond. What made the performance even more beautiful was the reactions from the audience with Oprah, Selma stars David Oyelowo and Carmen Ejogo, and Chris Pine all crying after the song ended. As if their performance wasn't enough, Common and Legend brought class, eloquence and emotion to their acceptance speeches for Best Original Song for "Glory." As two of the only African Americans of the whole night, Common brought up his and Legend's emotional performance of "Glory" at Selma, Alabama and related the struggle and hope to his own life. Legend, on the other hand, made sure to talk about how important the film is nowadays with the tension that continues to grow for race relations in this country. The struggle for justice is right now. We know that the voting rights, the act that they fought for 50 years ago is being compromised right now in this country today. We know that right now the struggle for freedom and justice is real. We live in the most incarcerated country in the world. There are more black men under correctional control today than were under slavery in 1850. When people are marching with our song, we want to tell you that we are with you, we see you, we love you, and march on. In a moment that was actually quite brilliant on the actor's part, Harris was not shy about criticizing the Oscars' lack of diversity in its nominations. His first joke of the night was about the issue: "Tonight we honor the best and whitest, I mean brightest." The actor continued the streak by going up to Oyelowo and asking him to say things in his British accent to prove everything sounds better in the accent. But when he approached the actor and the audience broke into applause, NPH landed this joke: "Oh sure, now you like him." At one point in the night when announcing presenters Jennifer Aniston & Oyelowo, Harris presented them by saying "two actors who truly deserve to be here," yet again bringing to attention that Oyelowo desperately deserved a Best Actor nomination. At every awards telecast, the Academy of Motion Pictures Arts and Sciences President always gives one (hopefully quick) speech about the show and its importance. When President Cheryl Boone Isaacs took to the stage, she fashioned her speech around the importance of expressing art and film and the strength behind it as a response to the North Korea attacks before the release of The Interview , but for some strange reason did not bring up the lack of diversity issue. It was extra upsetting especially because Isaacs is African American woman and this could have been the perfect platform to express remorse, or at least acknowledge, those who should be nominated. In a triple whammy, the Mexican director, writer, producer extraordinaire won three Oscars for his incredible film Birdman over another movie juggernaut Boyhood (and writer/director Richard Linklater), and despite a rather tasteless Sean Penn joke about the director, it did prove that the Oscars award at least a little diversity, and he wasn't the only one. The openly gay Graham Moore gave a beautiful speech about the importance of loving oneself for all of the weirdness and all the feeling of being different during his acceptance speech for Best Adapted Screenplay for The Imitation Game. Moore talked about how when he was 16 years old, he tried to kill himself because he felt too different to belong, but that it was time for those who felt different like he did to stay weird, and to pass along this important message. NPH told Octavia Spencer to watch over a ballot box the whole night and yes, it was supposed to be a joke, but it struck a wrong chord. As Bustle's Kadeen Griffiths points out, "There was nothing horrifically offensive about Spencer’s role in the ceremony, and certainly it gave her more airtime than her short presentation later into the program, but the way they went about it just sat wrong with me. There were so many other ways to involve a woman of color more deeply in the showmanship of the ceremony. Why have her watch a locked box for three hours as a gag?" It's a great, great question.